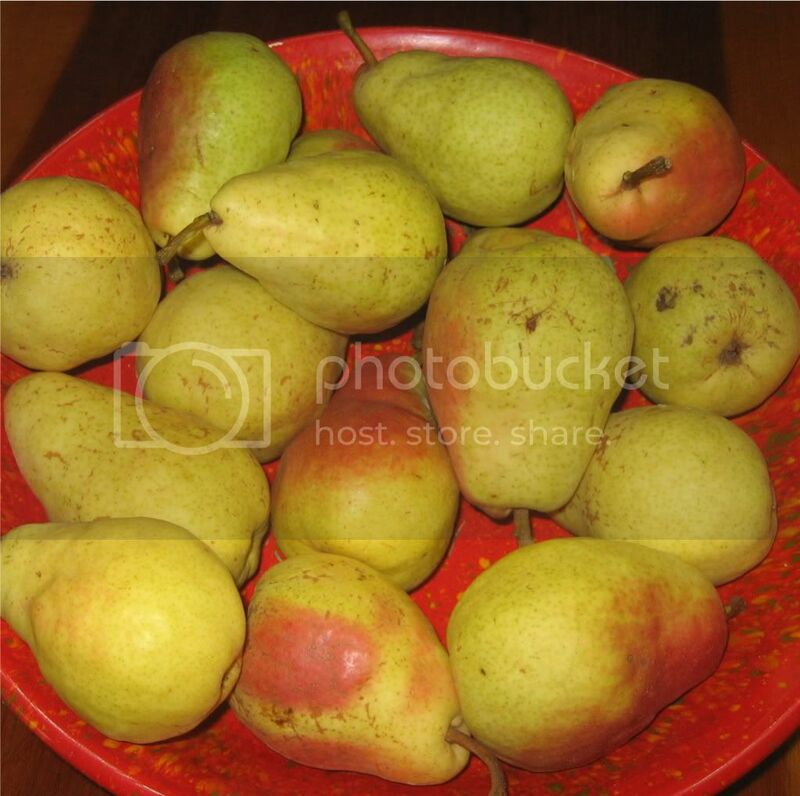 Above: A few of the last pears of GG’s Harvest! So this am I spied an estate sale over on Seminole–and a lot of locals were perusing the goods early this morning. Personally, I have not had much luck with such events in the fall, so I am glad someone is reaping the benefits. I hope to head over there for at least a look during my afternoon amble–if it isn’t raining to hard by then. Although I didn’t see the forecast yesterday, I knew by the clouds that thunder showers were on their way–and we got our share yesterday afternoon. I am always happy to have different weather and remember when I moved to the valley–every summer afternoon the thunderstorms would roll through, dusting the valley with rain. Lately that hasn’t been the case but yesterday can only be called a torrential downfall! As for me, today it was wood day. GG is fortunate to have such great neighbor pals since my strength and stamina have a way to go before being back to normal. I am also recovering from weekend guests that inadvertently kept me from sleeping. The exhaustion meant that I had to crawl into my cave to nap by early afternoon–which turned into a marathon resting adventure. The good news is that after some sleep I am feeling pretty good and functioning well enough that when Mike called and said he wanted to help me–that I got myself together. He was super on the splitter which meant that I got to place wood in the splitter, remove it, haul it, and eventually stack it. After he left, neighbor Bob dropped by and helped me with the stacking–so things went by quickly. It was also good that I broke a sweat, had a good visit with the guys and now am tackling my list of things to do that did not get done yesterday. The morning’s work yielded about 1/4 cord of wood which hopefully will hold me over until I can get some more delivered. I have a source that is supposed to be reasonable and reliable–but you know how that goes. You probably heard the news that Dean Fox passed away. This is sad news to Fawnskin residents. The Big Bear Horror Film Festival is this weekend if you are looking for something unusual. Finally, if you are looking for a job, October 16th is the second job fair at Bear Mountain. This entry was posted on Friday, October 15th, 2010 and is filed under Mountain Lake Resort, Small Town Living.